Every June, The Blank Theatre produces the 12 best plays by playwrights ages 9 to 19, chosen from a nationwide competition. In the past 26 years, we’ve produced 308 plays by these young writers. Nowhere else in the nation can young playwrights receive the prize of seeing their vision come to life on stage in a professional production featuring known actors from film, television and theatre. directors and each is given several public performances in a month-long Festival. theatre artists. There are no submission fees for this program. (2) we provide the playwrights a professional experience from beginning to end; they are never considered “students,” they are the playwrights. What began in 1993 as a one night only reading, with scripts submitted from Los Angeles County, has become a month-long festival of 12 plays professionally staged for full weekend runs, with submissions from 31 different states. 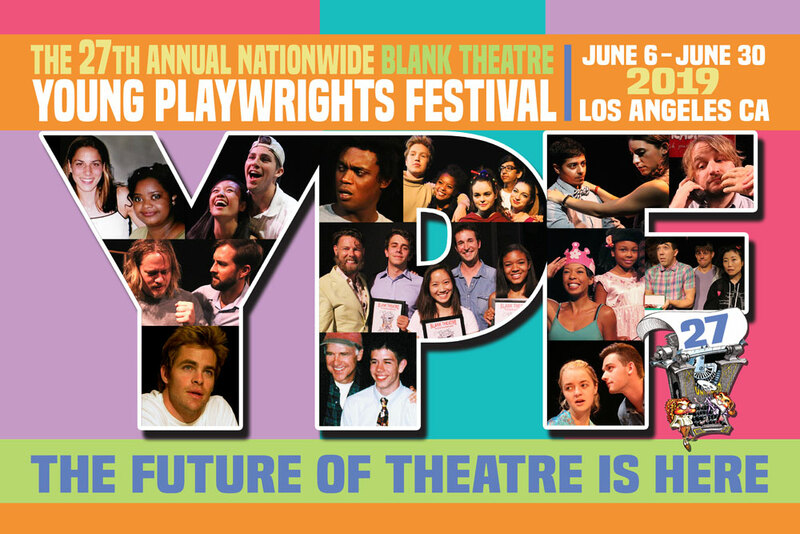 Under the direction of The Blank’s Founding Artistic Director Daniel Henning, The Blank’s Annual Nationwide Young Playwrights Festival is presented at The Stella Adler in Hollywood, CA in June of every year. Rehearsals also take place at The Blank’s 2nd Stage Theatre in Hollywood. The 12 winning plays are professionally produced for weekend-long runs. As a result of winning YPF, these exciting writers all made their professional stage debuts in Los Angeles. Along with 308 others over the years. The Young Playwrights Festival is a unique opportunity to magnify the voices of our youth, and thus not only present their interpretations of the world but channel their vision into the public consciousness. In the past few years, the decrease in arts funding at schools has made the arts even less accessible to children, and as made a career in the arts seem next to impossible for them. YPF works to restore this gap by providing students with the opportunity to be fully immersed in an artistic production, to have their unique voices heard on a national level, and to be introduced to the professional Theatre world. designed to sustain the art of Theatre for future generations. Victor Kaufold, a YPF winner, tackled the issue of school shootings in The Why which was then produced on our Mainstage for which Victor earned an Ovation Award nomination for “Best Writing-World Premiere” at 19 years old. Lauren Yee, a two-time YPF inner, is having her plays produced all across the country and was nominated for the prestigious John Gassner Award by the NY Outer Critics Circle. Austin Winsberg, a five-time winner, recently had his musical First Date open on Broadway this season and adapted the highly-successful The Sound of Music Live! on NBC. As a result of winning YPF, these exciting writers all made their professional stage debuts in Los Angeles. Along with 282 others over the years. Of all the work we do at The Blank, it is our nationwide Young Playwrights Festival that is creating the greatest long-term impact on the future of theatre. The Blank Theatre’s Annual Young Playwrights Festival brings attention to Los Angeles as an important creator of new theatrical artists and work, gives young people a chance to have their unique voices heard in a professional setting, and gives audiences a glimpse into these young hearts and minds — as well as the thrill of seeing future Pulitzer Prize Finalists and Broadway librettists in their first professional productions. Past Festivals have featured actors such as Chris Pine (STAR TREK), Katie Lowes (SCANDAL), Matthew Moy (2 BROKE GIRLS), Heather Morris and Max Adler (GLEE), Jeremy Sisto (LAW & ORDER, SIX FEET UNDER), Michael Welch (TWILIGHT), Brianna Brown (DEVIOUS MAIDS), Dee Wallace (ET: THE EXTRATERRESTRIAL), Dale Dickey (TRUE BLOOD, WINTER’S BONE), Noah Wyle (FALLING SKIES, ER), Nicholas Brendon, Sarah Michelle Gellar, James Marsters, Tom Lenk, Danny Strong and Eliza Dushku (BUFFY THE VAMPIRE SLAYER), Tiffani Thiessen (WHITE COLLAR), Josh Radnor and Alyson Hannigan (HOW I MET YOUR MOTHER), Sarah Drew (GREY’S ANATOMY), Debra Messing (WILL & GRACE, SMASH), Angel Parker (LAB RATS), Parvesh Cheena (SEAN SAVES THE WORLD), Mark Valley (BOSTON LEGAL), Constance Zimmer (HOUSE OF CARDS), Jerry O’Connell (JERRY MAGUIRE), Ariel Winter (MODERN FAMILY), Kathryn Joosten and Todd Grinnell (DESPERATE HOUSEWIVES), Megan Ward (GENERAL HOSPITAL), plus over 1200 other professional mentors, directors, actors, producers and crew!